SwimVacation offers private group travel for Masters Swim Teams, Open Water Clubs, and other groups seeking swimming based vacations. Our custom trips can be designed around training goals, stroke improvement, an open water challenge, or just a relaxing and bonding week of swimming. Other activities include yoga, massage, cultural experiences, SUP, outrigger canoe tours, hiking, snorkeling. The BVIs are a tropical archipelago in the Caribbean Sea, about 20 miles from Puerto Rico. 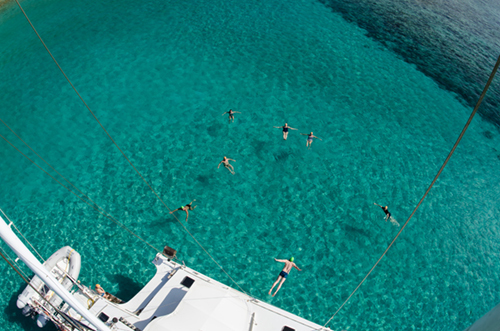 Turquoise waters, calm secluded bays, beautiful coral reefs and marine life make this a swimmer’s paradise. The best way to experience the islands is from a boat, and we choose from an impressive fleet of luxury yachts for our home base. We wake up, jump in, and go for a swim. Then we sail to the next beautiful spot and go for another swim. Every Day. For a week. It’s sublime. Hawaii is place with an aquatic culture, pristine coral reefs with abundant fish life, crystal clear waters, and amazing places to swim. Kona, Hawaii is an uncrowded, unspoiled swimmer’s paradise. Hawaiian culture is derived from elements of land and sea. We’ve adopted that concept to create a week with unparalleled oceanfront accommodations, cuisine, and unbelievable swimming. The clear, calm turquoise shallow Abaco Sea is a welcoming, natural pool for a week of fantastic swimming. These conditions make it perfect for novice open water swimmers, while its long stretches of unspoiled coastline and easy access to open ocean also give more advanced swimmers a way to challenge themselves. With its soft pastels and lots of options, the Abaco island chain is a paradise that offers something for every kind of swimmer. Our accommodations for the trip are on a luxury sailing yacht, with spacious, en suite bath state rooms and generous deck spaces. Perfect to explore the sleepy sandy cays that stretch out over 100 miles. Please contact us for best times of year to plan your group trip to these locations, or for more information.